Mega Sale! Save 24% on the Green Floral Crafts 30 in. Bamboo Ellipse Tall Vase & DIY Pods Floral Kit by Green Floral Crafts at Home Decor Outlet Store. MPN: 3028167BAM. Hurry! Limited time offer. Offer valid only while supplies last. 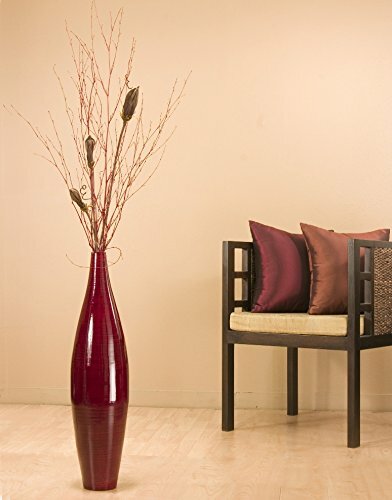 Beautiful ellipse shape floor vase offered in 2 sizes and many colors. Tall size measures 41''H x 11'' diameter and small size is 30''H x 7 diameter. Beautiful ellipse shape floor vase offered in 2 sizes and many colors. Tall size measures 41"H x 11" diameter and small size is 30"H x 7 diameter. Included are natural dried branches (arrangement requires assembly). As each vase is individually hand crafted, sizes may vary up to 1" within a size category. Included are natural bamboo branches Choose from our sleek, lacquered finishes for a high style, classy look. If you prefer a more natural, organic look, select from our stained finishes of cocoa brown, mahogany red or natural bamboo finish. Beautiful ellipse shape floor vase in tall size measures 41"H x 11" diameter and small size is 30"H x 7 diameter. As each vase is individually hand crafted, sizes may vary up to 1"
Beautifully handcrafted from natural bamboo cut into strips, and only the soft center, the heart bamboo is used to make the vase. Bamboo vases are lightweight. If you have carpet or pets, put small pebbles or sand into ziplock bags and place at bottom of vase for added stability. Please choose colors and sizes carefully. Be aware that colors shown on different monitors will vary and the vase seen in person may not match with what your monitor shows.. If you need a close match on color for your home decor, it is better to purchase in a physical store. If you have any questions about this product by Green Floral Crafts, contact us by completing and submitting the form below. If you are looking for a specif part number, please include it with your message.